Breaking news, Central Ethics Review Board (CEPN) decided today on the case of trachea transplant surgeon Paolo Macchiarini. The expert review by Martin Björck, professor of surgery at University of Uppsala, and Detlev Ganten, professor emeritus of pharmacology and former CEO of the Charité, on which this decision is based, is available here on my site. The Expert Group on Scientific Misconduct has on request from the Karolinska Institut (KI) delivered a Statement in a case where Paolo Macchiarini is one of the researchers accused of scientific misconduct. The case comprises six articles which mainly deals with transplantation of synthetic tracheas. These articles have previously been reviewed by Professor Bengt Gerdin, who found scientific misconduct in all six articles. Despite that, KI choose to clear Paolo Macchiarini and the co-authors. KI have thereafter opened the case again. The Expert Group have appointed two external experts, Professor Martin Björck, Uppsala and Professor Detlev Ganten, Berlin. They have similarly to Bengt Gerdin, founded that there arescientific misconduct in the articles in question. The Expert Group state that the transplantations are described successfully in the articles, which is not the fact. The Expert Group also establish that the information in the articles are misleading and beautifying regarding the patients conditions and furthermore that information has been withhold in this purpose and that this constitutes scientific misconduct. In addition,there is false information of ethical approval, which also constitute scientific misconduct. The Expert Group finds that all co-authors to the six articles are guilty of scientific misconduct. The responsibility is however different amongst the authors. The main responsibility lies on Paolo Macchiarini as the main author and research-leader and others who have had a more prominent role in the research and the authorship. The more detailed responsibility and the future consequences for the respective authors is up to their employers to decide. The Expert Group request the different publications to withdraw all six articles. CEPN recommends this Jungebluth et al 2011 paper by Macchiarini is to be retracted, togetehr with 5 others. For further information, please refer to my exclusive list of Macchiarini’s trachea transplant patients. Also please read my scoop on the biased police investigation, which found nothing wrong in the way Macchiarini treated the three trachea transplant patients at KI hospital. As a key and senior researcher and co-author, Macchiarini’s student and acolyte Philipp Jungebluth is found by CEPN to share the central responsibility for misrepresenting the medical situation of the patients and telling untruths about non-existent ethics approvals. He is currently suing me in two different injunction trials in Berlin, where he simultaneously presents the trachea transplants as full successes and declares to have had nothing to do with those. Karolinska whistleblowers are largely absolved of their guilt as co-authors. KI is instead criticising for going after them, while protecting Macchiarini. Follows the full CEPN statement, in English original, as CEPN sent it to me (hyperlinks and highlighting mine). A Swedish version is here. After an initial inquiry at Karolinska Institutet, it was decided that a separate statement should be obtained from an external investigator, Emeritus Professor Bengt Gerdin. According to Bengt Gerdin’s opinion, Paolo Macchiarini has acted dishonestly in all of the six published articles, which constitutes research misconduct. However, in a decision of 28 August 2015, Karolinska Institutet announced that an overall assessment had cleared Paolo Macchiarini of the accusation of misconduct in research. Karolinska Institutet subsequently decided that these matters should be investigated again, and that an statement from the Expert Group on Misconduct in Research would be obtained. In KI’s request, the Expert Group is instructed to issue a statement on whether what emerges from the attached documents in the case can be deemed to constitute misconduct in research. On March 18, 2017 the Expert Group decided to appoint Professor Martin Björck, Uppsala, and Professor Detlev Ganten, Berlin, as the external reviewers in this case. Martin Björck’s and Detlev Ganten’s report was delivered to the Expert Group on 31 May 2017, after which the authors accused of misconduct have been afforded the opportunity to reply. The following authors submitted replies: Arthur Caplan, Sylvia le Guyader, Staffan Strömblad, Alessandra Bianco, Philipp Jungebluth, Sebastian Sjöqvist, Mei Ling Lim, Paolo Macchiarini, Tomas Gudbjartsson, Ola Hermanson, Karl-Henrik Grinnemo, Mathias Corbascio, Oscar Simonson and Katarina Le Blanc. Martin Björck and Detlev Ganten have subsequently been afforded the opportunity to comment on the replies received. To begin with, the Expert Group accepts that the case is extensive and that, besides the scientific articles previously complained of, the case now contains large quantities of material in the form of patient records and research data, among other things. This material has been reviewed in all its essentials by Professor Bengt Gerdin, appointed as an independent investigator by Karolinska Institutet. Bengt Gerdin’s report, as well as his comments received subsequently, have therefore been included in the material that the Expert Group has examined. Bengt Gerdin’s conclusion is that scientific misconduct was found in all six articles. Bengt Gerdin based his overall conclusion on the fact that clinical results were reported without any examinations of the patients having been conducted; that the descriptions of the facts were not consistent with the notes in medical records; that the impression was given of a longer follow- up period than was actually the case; that results had been misrepresented and withheld; and that it was explicitly stated that ethics approval had been gained in spite of the fact that such approval was lacking. After Bengt Gerdin submitted his report, Karolinska Institutet afforded the authors of the six articles the opportunity to comment on the report. In this connection, Paolo Macchiarini presented significant quantities of original material, including material that Bengt Gerdin had expressly requested from Paolo Macchiarini but had not been given access to. This circumstance lies beyond the scope of the Expert Group’s task, but Paolo Macchiarini’s action in not providing Bengt Gerdin with the requested material can in itself constitute scientific misconduct. Furthermore, it is noted that in a subsequent reply to Karolinska Institutet, Bengt Gerdin did not find any reason to revise his previous positions concerning misconduct in research in view of the authors’ comments. The Expert Group has carefully examined the observations and conclusions made by Bengt Gerdin, and notes that his review is painstaking, thorough and analytical. The external reviewers engaged by the Expert Group for the examination of the case, Martin Björck and Detlev Ganten, were tasked with examining whether misconduct was present in any one or more of the six reported articles. The external reviewers were instructed to review Bengt Gerdin’s report as well as the material that was subsequently added to the case. Martin Björck and Detlev Ganten have had access to all the material in the case but the focus has thus been on Bengt Gerdin’s analysis and whether or not Bengt Gerdin was correct in his conclusions, as well as on the material added to the case after Bengt Gerdin completed his task. clearly of a nature that it ought to be reviewed in accordance with Sweden’s Lag (2003:460) om etikprövning av forskning som avser människor (Act concerning the Ethical Review of Research Involving Humans), which has not occurred. Furthermore, it is noted that five of the six reported articles (1–4 and 6) contain hyped descriptions and lack critical analyses. The article authors are of the opinion that the health statuses of the patients after transplantation and the new medical device – the trachea of plastic – have been presented as significantly better than was actually the case. In this regard, Martin Björck and Detlev Ganten stress that these incorrect claims, if accepted by other physicians, can have serious consequences for a large number of patients. Martin Björck and Detlev Ganten are of the opinion that this constitutes a serious deviation from good research practice and thus constitutes scientific misconduct. In their rebuttals of Martin Björck’s and Detlev Ganten’s report, some of the accused authors express regret over their participation and are of the opinion that the articles ought to be withdrawn on the grounds that they contain serious inaccuracies. Some authors have expressed that they only had a minor role and hence that they cannot be held responsible for the article as a whole. It has also been argued that the manuscript was not sent to them for checking and that they were misled by Paolo Macchiarini. The replies also include argumentation for co- authors in general not being held responsible for the content of the scientific article as a whole. In their comments in relation to these replies, Martin Björck and Detlev Ganten state that nothing has been put forward that changes their original assessment that articles 1–4 and 6 contain misconduct in research. The Expert Group notes that all the reported articles deal with transplantations of synthetic trachea and related research. In all six articles, the transplantations are described as successful. It can be concluded that this was not the case. The articles cover three patients, all of whom have died. The Expert Group makes no pronouncement on whether their deaths are a consequence of the synthetic trachea implants. However, the material as a whole shows that in no case did the transplant attain functional status but on the contrary gave rise to serious complications. The Expert Group finds that the authors of article 1 have given a misleading picture of the condition of the patient by claiming that the patient’s health status was significantly better than it actually was. By virtue of this highly coloured description, the authors of the article are guilty of scientific misconduct. Concerning the absence of the requisite approval under Sweden’s Act (2003:460) concerning the Ethical Review of Research Involving Humans, the Expert Group makes the following assessment. The absence of ethics approval is in itself a breach of the Act (2003:460) concerning the Ethical Review of Research Involving Humans. In its previous opinions, the Expert Group has not deemed the absence of ethics approval in itself as constituting misconduct in research. However, to falsely state that ethics approval has been obtained, which was done in article 1, does constitute misconduct in research. The authors are thus guilty of scientific conduct in this regard also. Article 2 contains no actual new data but refers to article 1. The article gives an erroneous and highly coloured description of the state of the patient’s health, which is demonstrated in a comparison between the article and the patient’s medical record notes. This whitewashing can be regarded as misconduct in research. Even in articles 3 and 4, there are descriptions of the patient’s condition as being significantly better than it actually was, which constitutes misconduct in research. Even in article 6, material information has been omitted. Thus, a better picture of the results of the experiments conducted is given in the article. Article 5, which is a review article based on the reported original articles, is not as detailed as the rest of the articles. For this reason, Martin Björck and Detlev Ganten have chosen not to assess it as containing misconduct in research. However, like Bengt Gerdin, the Expert Group is of the opinion that the article’s description of the patients, and the fact that negative information has been withheld, together constitutes misconduct in research. This article also helps to spread inaccurate information about the claimed superiority of the new surgical procedure. In conclusion, the Expert Group finds that all six reported articles contain information which constitutes misconduct in research. Concerning whom or who of the authors can be held responsible for the scientific misconduct, the Expert Group makes the following assessment. All four criteria must be met in order to justify designation as an author of a scientific article. These criteria can be seen as a codification of the professional ethics principles in the world of medical research. All of the journals in this case have also endorsed these principles. The fourth criterion, which was added in 2013, is an expression of accepted practice which was applied even before 2013, i.e. at the time of publication of these articles. While the Expert Group is aware that the Vancouver rules are not the only view on the matter of authorship, in previous opinions the Expert Group has argued that it may be regarded as good research practice that those authors who have unreservedly approved a manuscript assume a collective responsibility for it. This is also the attitude of the All European Academies (ALLEA) in the European Code of Conduct for Research Integrity, 2017. If a scientific article is deemed to be marred by such serious shortcomings that a conclusion of scientific misconduct can be drawn, in such cases responsibility consequently rests with all of its co-authors. The Expert Group is in agreement with this assessment. Even if not all journals and scientific associations have adopted the Vancouver rules, it can be concluded that most have embraced the principles behind these rules. In other words, as mentioned above, they may be regarded as a codification of professional ethics principles in research. 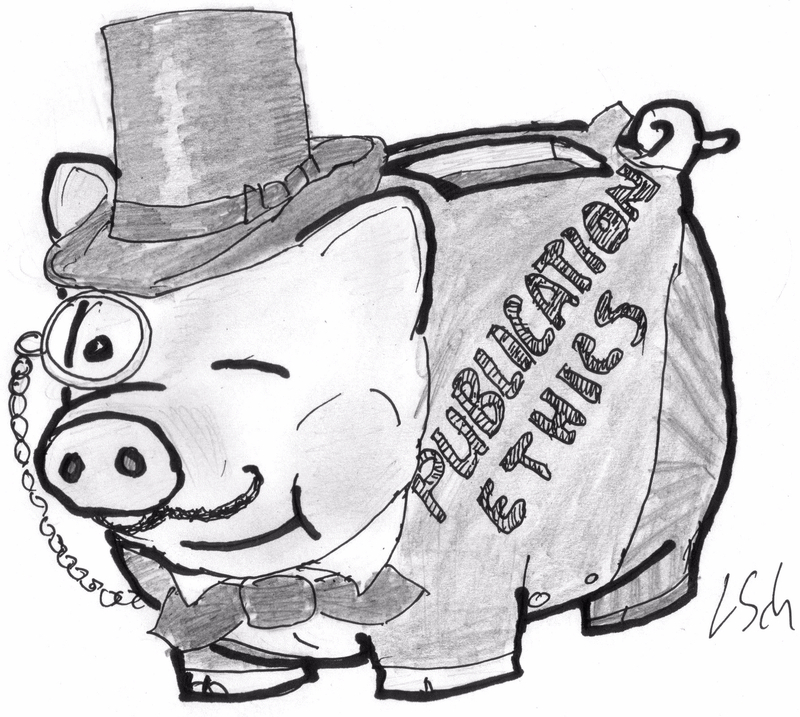 The fact that the six reported articles have been published in journals that have all endorsed the Vancouver rules additionally emphasises that these rules ought to be the basis for assessing the responsibility of each co-author. In the light of the nature of the merits system within the academic world, the Expert Group is well aware that it is highly desirable to participate as a co-author in scientific journal articles. Authorship of articles, particularly those published in prestigious journals and with many citations, is a significant source of academic merit value in itself, which leads to greater opportunities for obtaining research grants and higher-level positions. However, this must not lead to the assumption of authorship for journal articles that the co-author cannot fully support. In a scientific article with complex content where a number of researchers have contributed to the whole, many with specialised skills, it is not reasonable to require that all of them should have detailed knowledge of the contribution of each of the others to the final article. On the other hand however, in the opinion of the Expert Group it is not possible to completely absolve themselves of responsibility for the article as a whole and only take responsibility for their own contribution unless this is specifically stated at the beginning or end of the article. In the present case, the lack of ethics approval and the persistent claim that the health of the patients was significantly better than it actually was are deemed to be circumstances which could easily have been discovered, even by non-specialists. The Expert Group has not considered it possible to more closely investigate to what extent some authors were not shown manuscripts or were otherwise misled as to their content, which was claimed in some of the replies from the accused authors. If this was the case, those affected also ought to have reacted and requested that their names be removed when the publication came to their knowledge, rather than only after the articles were called into question. According to the Expert Group, is not a reasonable system to renounce responsibility only after fault has been found with an article. A less than complete responsibility ought to be stated at the time of publication, and if this is not the case, then responsibility for any irregularities should be borne by the entire author collective. The same assessment should be applied when a person first requests that their name be removed long after publication. It is not reasonable to renounce responsibility in this way. The Expert Group finds that all the authors of the six articles bear some measure of responsibility for scientific misconduct. However, this responsibility is differentiate in regard to their contribution in the research and authorship. The primary responsibility rests with Paolo Macchiarini as the main author and head of the research team, and with others who had a more prominent role in the research and the writing of the articles. The particular measure of responsibility of each author and what actions should thus be taken for each of them is up to their respective employers to determine. However, the Expert Group understands that the more junior researchers have been in a position of dependence in relation to Paolo Macchiarini and other leaders of the research team, which at the time when the research was conducted also enjoyed substantial support from the management of Karolinska Institutet. While this does not absolve them of responsibility, it may be regarded as an extenuating circumstance. Three of the four complainants to Karolinska Institutet in the case – the whistle-blowers – are co-authors of one of the articles, and one was also a co-author of an additional article. The Expert Group is of the opinion that the whistle-blowers should be recognised for having reported the irregularities to Karolinska Institutet, yet this does not absolve them of author responsibility. However, in relation to the other co-authors, they did react against the irregularities in the publications and in procedure at an early stage, which according to the Expert Group should be credited to the whistle-blowers in their employers’ coming assessments of what action to take. The Expert Group finds it remarkable that, despite serious criticism from their external investigator Bengt Gerdin, the former management of Karolinska Institutet took no action against Paolo Macchiarini and others with more prominent positions in the research. It appears striking that the whistle-blowers were instead subjected to disproportionately far-reaching actions. In the opinion of the Expert Group, all the articles ought to be withdrawn. This concludes the processing of this case from the Expert Group’s point of view. This statement has been decided by Lena Berke, Chair, Lena Halldenius, Holger Luthman, Elisabeth Rachlew, Ann-Charlotte Smedler, Elin Wihlborg and Göran Sandberg. In the final hearing of this case, the following substitutes were also present: Jerry Eriksson, Aleksander Giwercman, Christina Moberg, Björn Petersson and Karin Sporre, Administrative Director Jörgen Svidén, and Administrative Secretary Eva Kaaman Modig. Hello, TETRA researchers? See this carpet? It has just been pulled out from under you. I am especially happy to see that the decision very clealy states that co-authors share responsibility with Macchiarini. Jungebluth is in this case admitted to be guilty of fraud, it must help a lot in your fight against all court actions. I get the impression that the German courts are not concerned with the accuracy of Leonid’s criticism of Jungebluth; his offence is all about the existence of that criticism. The heavy-handedness of the German courts is one negative about an otherwise positive country. I hope these news will be spread and that it will put an end to the funding of the unbelievable technology of artificial and cadaver trachea with rotten stem cells. Hopefully they will also put this cowboy in jail. Thank you Leonid for your hard work!